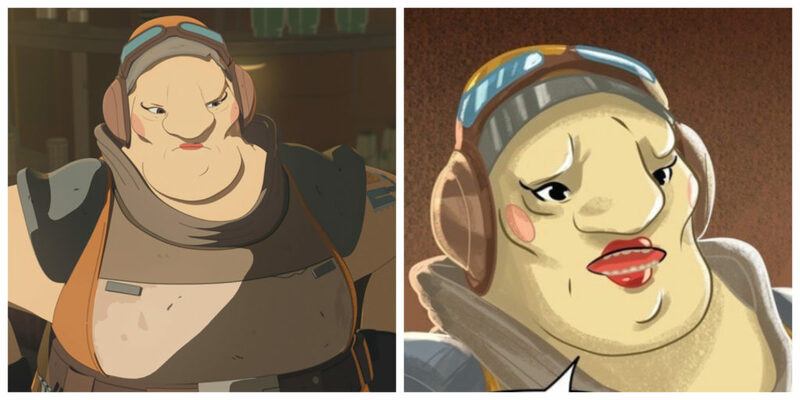 Aunt Z in an episode of Star Wars Resistance (left) and from “All Aces Battle Royale” (right). Art by Valentina Pinto. Aunt Z AKA Z’Vk’Thkrkza runs a tavern on the refueling station called the Colossus in the TV series Star Wars Resistance. She has appeared in many of the show’s episodes and shorts as well as the Star Wars Adventures story “All Aces Battle Royale”. She also makes a mean Parmarthen Bantha stew if you’re brave enough to try it. Actress Tovah Feldshuh voices Aunt Z for Resistance.